Many travellers are exposed to a higher risk of contamination of their toothbrush due to leaving it on a hotel sink or unprotected in a travel kit. The UV germicidal light bulb kills up to 99.9% of the bacteria, such as E.Coli, salmonella, and other harmful microorganisms. Researchers have found more than 10,000,000 bacteria can be living on a single toothbrush. Bacteria, molds, and fungi love moist environments which are commonly found in most plastic travel toothbrush holders. The ADA and most dentists recommend changing toothbrushes only every 3 to 4 months; however it is important to sanitize your toothbrush every day. 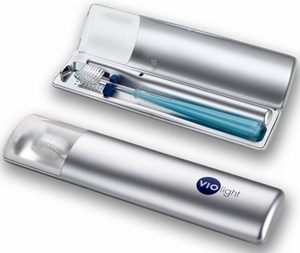 Use as a case to keep your toothbrush while on the road.